Walter Houser Brattain (/ˈbrætən/; February 10, 1902 – October 13, 1987) was an American physicist at Bell Labs who, along with fellow scientists John Bardeen and William Shockley, invented the point-contact transistor in December 1947. They shared the 1956 Nobel Prize in Physics for their invention. Brattain devoted much of his life to research on surface states. Walter Brattain married twice. His first wife was chemist Keren Gilmore. They married in 1935 and had a son, William G. Brattain, in 1943. Keren Gilmore Brattain died April 10, 1957. Walter Brattain married Mrs. Emma Jane (Kirsch) Miller, who already had three children, in 1958. He moved to Seattle, Washington, in the 1970s where he lived until his death. He died on October 13, 1987, in a nursing home in Seattle from Alzheimer's Disease. He is buried in Pomeroy City Cemetery, Garfield County, Washington, USA. From 1927 to 1928 Brattain worked for the National Bureau of Standards in Washington, D.C., where he helped to develop piezoelectric frequency standards. In August 1929 he joined Joseph A. Becker at Bell Telephone Laboratories as a research physicist. The two men worked on the heat-induced flow of charge carriers in copper oxide rectifiers. :72 Brattain was able to attend a lecture by Arnold Sommerfeld. Some of their subsequent experiments on thermionic emission provided experimental validation for the Sommerfeld theory. They also did work on the surface state and work function of tungsten and the adsorption of thorium atoms. :74 Through his studies of rectification and photo-effects on the semiconductor surfaces of cuprous oxide and silicon, Brattain discovered the photo-effect at the free surface of a semiconductor. This work was considered by the Nobel prize committee to be one of his chief contributions to solid state physics. At the time, the telephone industry was heavily dependent on the use of vacuum tubes to control electron flow and amplify current. Vacuum tubes were neither reliable nor efficient, and Bell Laboratories wanted to develop an alternative technology. As early as the 1930s Brattain worked with William B. Shockley on the idea of a semiconductor amplifier that used copper oxide, an early and unsuccessful attempt at creating a field effect transistor. Other researchers at Bell and elsewhere were also experimenting with semiconductors, using materials such as germanium and silicon, but the pre-war research effort was somewhat haphazard and lacked strong theoretical grounding. During World War II, both Brattain and Shockley were separately involved in research on magnetic detection of submarines with the National Defense Research Committee at Columbia University. Brattain's group developed magnetometers sensitive enough to detect anomalies in the earth's magnetic field caused by submarines. :104 As a result of this work, in 1944, Brattain patented a design for a magnetometer head. In 1945, Bell Labs reorganized and created a group specifically to do fundamental research in solid state physics, relating to communications technologies. Creation of the sub-department was authorized by the vice-president for research, Mervin Kelly. An interdisciplinary group, it was co-led by Shockley and Stanley O. Morgan. :76 The new group was soon joined by John Bardeen. Bardeen was a close friend of Brattain's brother Robert, who had introduced John and Walter in the 1930s. They often played bridge and golf together. :77 Bardeen was a quantum physicist, Brattain a gifted experimenter in materials science, and Shockley, the leader of their team, was an expert in solid-state physics. According to theories of the time, Shockley's field effect transistor, a cylinder coated thinly with silicon and mounted close to a metal plate, should have worked. He ordered Brattain and Bardeen to find out why it wouldn't. During November and December the two men carried out a variety of experiments, attempting to determine why Shockley's device wouldn't amplify. Bardeen was a brilliant theorist; Brattain, equally importantly, "had an intuitive feel for what you could do in semiconductors". :40 Bardeen theorized that the failure to conduct might be the result of local variations in the surface state which trapped the charge carriers. :467–468 Brattain and Bardeen eventually managed to create a small level of amplification by pushing a gold metal point into the silicon, and surrounding it with distilled water. Replacing silicon with germanium enhanced the amplification, but only for low frequency currents. On December 16, Brattain devised a method of placing two gold leaf contacts close together on a germanium surface. Brattain reported: "Using this double point contact, contact was made to a germanium surface that had been anodized to 90 volts, electrolyte washed off in H2O and then had some gold spots evaporated on it. The gold contacts were pressed down on the bare surface. Both gold contacts to the surface rectified nicely... One point was used as a grid and the other point as a plate. 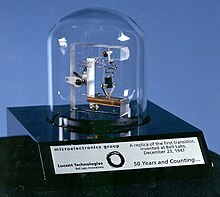 The bias (D.C.) on the grid had to be positive to get amplification"
On December 23, 1947, Walter Brattain, John Bardeen, and William B. Shockley demonstrated the first working transistor to their colleagues at Bell Laboratories. Amplifying small electrical signals and supporting the processing of digital information, the transistor is "the key enabler of modern electronics". The three men received the Nobel Prize in Physics in 1956 "for research on semiconductors and the discovery of the transistor effect." Brattain transferred to another research group within Bell Laboratories, working with C. G. B. Garrett, and P. J. Boddy. He continued to study the surface properties of solids and the "transistor effect", so as to better understand the various factors underlying semiconductor behavior. :79–81 Describing it as "an intolerable situation", Bardeen left Bell Laboratories in 1951 to go to the University of Illinois, where he eventually won a second Nobel Prize for his theory of superconductivity. Shockley left Bell Laboratories in 1953 and went on to form the Shockley Semiconductor Laboratory at Beckman Instruments. In 1956, the three men were jointly awarded the Nobel Prize in Physics by King Gustaf VI Adolf of Sweden "for research on semiconductors and the discovery of the transistor effect." Bardeen and Brattain were included for the discovery of the point-contact transistor; Shockley for the development of the junction transistor. Walter Brattain is credited as having said, when told of the award, "I certainly appreciate the honor. It is a great satisfaction to have done something in life and to have been recognized for it in this way. However, much of my good fortune comes from being in the right place, at the right time, and having the right sort of people to work with." Each of the three gave a lecture. Brattain spoke on Surface Properties of Semiconductors, Bardeen on Semiconductor Research Leading to the Point Contact Transistor, and Shockley on Transistor Technology Evokes New Physics. Brattain later collaborated with P. J. Boddy and P. N. Sawyer on several papers on electrochemical processes in living matter. :80 He became interested in blood clotting after his son required heart surgery. He also collaborated with Whitman chemistry professor David Frasco, using phospholipid bilayers as a model to study the surface of living cells and their absorption processes. Brattain taught at Harvard University as a visiting lecturer in 1952 and at Whitman College as a visiting lecturer in 1962 and 1963, and a visiting professor beginning in 1963. Upon formally retiring from Bell Laboratories in 1967, he continued to teach at Whitman, becoming an adjunct professor in 1972. He retired from teaching in 1976 but continued to be a consultant at Whitman. At Whitman, the Walter Brattain Scholarships are awarded on a merit basis to "entering students who have achieved high academic excellence in their college preparatory work." All applicants for admission are considered for the scholarship, which is potentially renewable for four years. Walter Brattain has been widely recognized for his contributions. ^ a b c d e Riordan, Michael; Hoddeson, Lillian (1998). Crystal fire : the invention of the transistor and the birth of the information age. New York [u.a. ]: Norton. p. 78. ISBN 9780393318517. Retrieved 4 March 2015. ^ "Brattain, Walter H. (1902–1987), Physicists, Physicists, Nobel Prize Winners". American National Biography Online. 2001. ISBN 9780198606697. Retrieved 4 March 2015. ^ a b c d e f g h i j k Bardeen, John (1994). Walter Houser Brattain 1902–1987 (PDF). Washington, D.C.: National Academy of Sciences. Retrieved 4 March 2015. ^ "Robert Brattain". PBS Online. Retrieved 4 March 2015. ^ Bardeed, John (1994). "Walter Houser Brattain, 1902—1987" (PDF). National Academy of Sciences. ^ a b c d e f g h Coca, Andreea; McFarland, Colleen; Mallen, Janet; Hastings, Emi. "Guide to the Walter Brattain Family Papers 1860–1990". Northwest Digital Archives (NWDA). Retrieved March 29, 2018. ^ "NECROLOGY". Chemical and Engineering News. 35 (19): 58. May 13, 1957. doi:10.1021/cen-v035n019.p058. ^ "Walter Houser Brattain". Find A Grave. Retrieved 6 March 2015. ^ a b c "Oral History interview transcript with Walter Brattain January 1964 & 28 May 1974". Niels Bohr Library and Archives. American Institute of Physics. 4 March 2015. ^ a b c Levine, Alaina G. (2008). "John Bardeen, William Shockley, Walter Brattain Invention of the Transistor – Bell Laboratories". APS Physics. Retrieved 4 March 2015. ^ a b c d e f Braun, Ernest; Macdonald, Stuart (1982). Revolution in miniature : the history and impact of semiconductor electronics (2nd. ed.). Cambridge: Cambridge University Press. ISBN 978-0521289030. ^ "Integral-drive magnetometer head US 2605072 A". Retrieved 5 March 2015. ^ a b Isaacson, Walter (December 4, 2014). "Microchips: The Transistor Was the First Step". Bloomberg Business. Retrieved 4 March 2015. ^ Hoddeson, Lillian. "Gentle Genius UI professor John Bardeen won two Nobel prizes – so why don't more people know about him?". University of Illinois Alumni Association. Retrieved 6 March 2015. ^ a b c d e Hoddeson, Lillian (1992). Out of the crystal maze : chapters from the history of solid state physics. New York: Oxford University Press. ISBN 978-0195053296. Retrieved 4 March 2015. ^ Lundstrom, Mark (2014). Essential Physics of Nanoscale Transistors. World Scientific Pub Co Inc. ISBN 978-981-4571-73-9. Retrieved 4 March 2015. ^ a b c d Kessler, Ronald (April 6, 1997). "Absent at the Creation; How one scientist made off with the biggest invention since the light bulb". The Washington Post Magazine. Archived from the original on 24 February 2015. Retrieved 5 March 2015. ^ Inventors and inventions. New York: Marshall Cavendish. 2007. pp. 57–68. ISBN 978-0761477617. Retrieved 5 March 2015. ^ "Shockley, Brattain and Bardeen". Transistorized. PBS. Retrieved 5 March 2015. ^ a b c "Walter Houser Brattain". How Stuff Works. Retrieved 5 March 2015. ^ Carey, Jr., Charles W. (2006). American Scientists. Infobase Publishing. pp. 39–41. ISBN 978-0816054992. Retrieved 5 March 2015. ^ Brock, David C. (29 Nov 2013). "How William Shockley's Robot Dream Helped Launch Silicon Valley". IEEE Spectrum. Retrieved 10 April 2014. ^ a b "Nobel Prize in Physics Awarded to Transistor Inventors". Bell System Technical Journal. 35 (6): i–iv. 1956. doi:10.1002/j.1538-7305.1956.tb03829.x. ^ Brattain, Walter H. (December 11, 1956). "Surface Properties of Semiconductors". Nobel Lecture. Nobelprize.org. ^ Bardeen, John (December 11, 1956). "Semiconductor Research Leading to the Point Contact Transistor". Nobel Lecture. Nobelprize.org. ^ Shockley, William (December 11, 1956). "Transistor Technology Evokes New Physics". Nobel Lecture. Nobelprize.org. ^ "Special Scholarship Programs". Whitman College. Archived from the original on 2 April 2015. Retrieved 5 March 2015. ^ "Case File of John Bardeen and Walter Brattain Committee on Science and the Arts 1954 Ballantine Medal". Franklin Institute. Retrieved 5 March 2015. Walter Brattain family papers at the Whitman College and Northwest Archives, Whitman College. "Oral History interview transcript with Walter Brattain January 1964 & 28 May 1974". Niels Bohr Library and Archives. American Institute of Physics. 4 March 2015. Bardeen, John (1994). Walter Houser Brattain 1902–1987 (PDF). Washington, D.C.: National Academy of Sciences.